JRHMS Notification is out. JRHMS is recruiting for 40 Chief Minister Health Advisors Govt Job Posts. 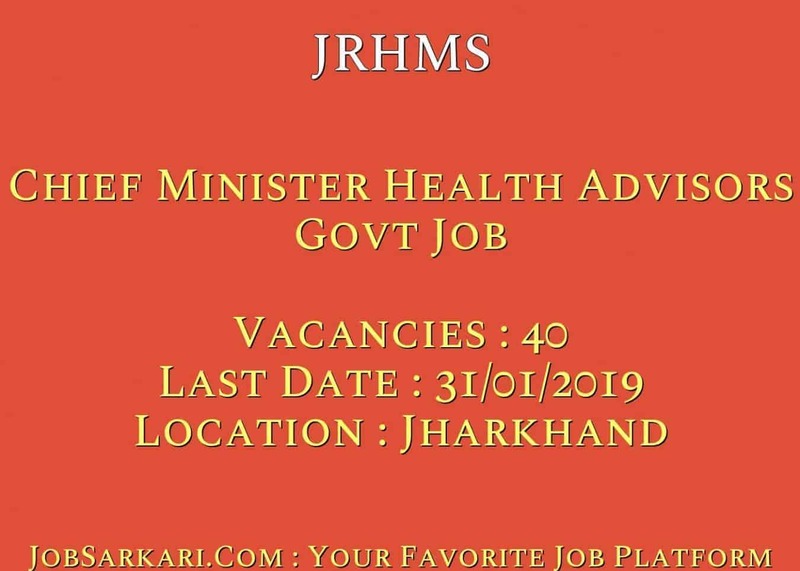 You can check JRHMS - Jharkhand Rural Health Mission Society last date, download JRHMS notification, visit JRHMS official website and check other JRHMS Vacancy details.Complete Vacancy and recruitment Details about 40 Chief Minister Health Advisors Govt Job vacancies in JRHMS are provided below by JobSarkari.Com only for you. Last Date for Receipt of Application Form. 31/01/2019. Chief Minister Health Advisors Candidate Must Have Passed Graduate From Top 15 Medical Institutions and Post Graduate in any Discipline From Top 10 Management Institutions and Excellent Command Over Hindi/English Computer Proficiency with High level of Familiarity with Commonly Used Packages Like MS Word, Excel and Power Point. Maximum 35 Years. 40. The Mission Director Jharkhand Rural Health Mission Society, GVI Campus, Namkum, Ranchi – 834010, Jharkhand On or Before 31st January 2019. Q. What is the Last Date For JRHMS Chief Minister Health Advisors Govt Job Vacancy ? A. 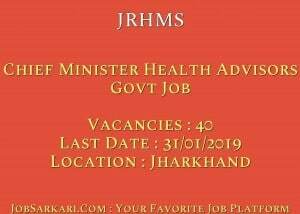 Last Date for JRHMS Chief Minister Health Advisors Govt Job Posts is 31/01/2019. Q. What is the Form Type of JRHMS Chief Minister Health Advisors Govt Job Recruitment ? A. The Form Type for JRHMS Chief Minister Health Advisors Govt Job Posts is Offline. Q. How many vacancies are available in Jharkhand Rural Health Mission Society Chief Minister Health Advisors Govt Job Posts ? A. There are about 40 Vacancies in Jharkhand Rural Health Mission Society Chief Minister Health Advisors Govt Job Posts. Q. What is the Full Form of JRHMS ? A. Full Form of JRHMS is Jharkhand Rural Health Mission Society .